Like many of us predisposed towards Vintage Iron, I do enjoy spending some time now and then learning about what's new. There are many reasons for this. The first is that most of us, or at least many of us, own a relatively new or modern vehicle. It maybe for the commute to work or for a business or the family vehicle, or the vehicle that you take when you absolutely don't want to worry about 40-year-old parts reaching their end-of-life during the long trip into the outback. 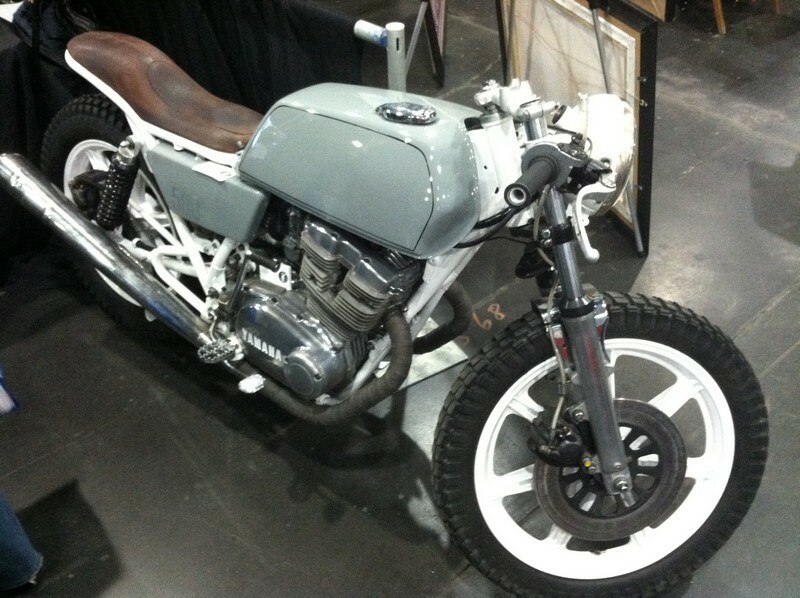 My two wheeled version of this is a BMW R1200GSA from a few years ago. A brilliant vehicle for when the going gets rough or for when the rough decide to get going. But I digress. Going to see what is new and exciting, whether you do that via the web, via magazine, or via visiting a show as we did in this case, is interesting and informative. 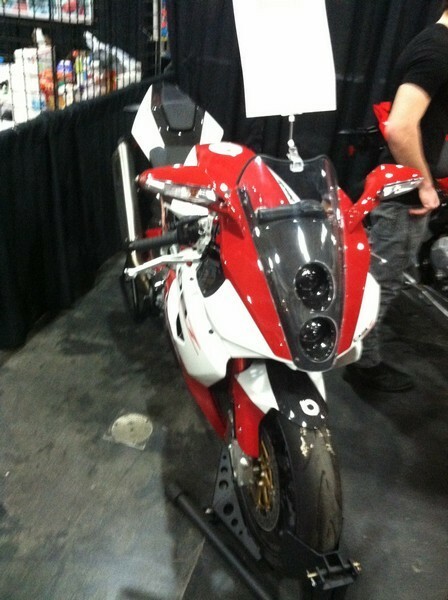 The New York international motorcycle show (IMS) is a little bit of cheating on the new vehicle thing. 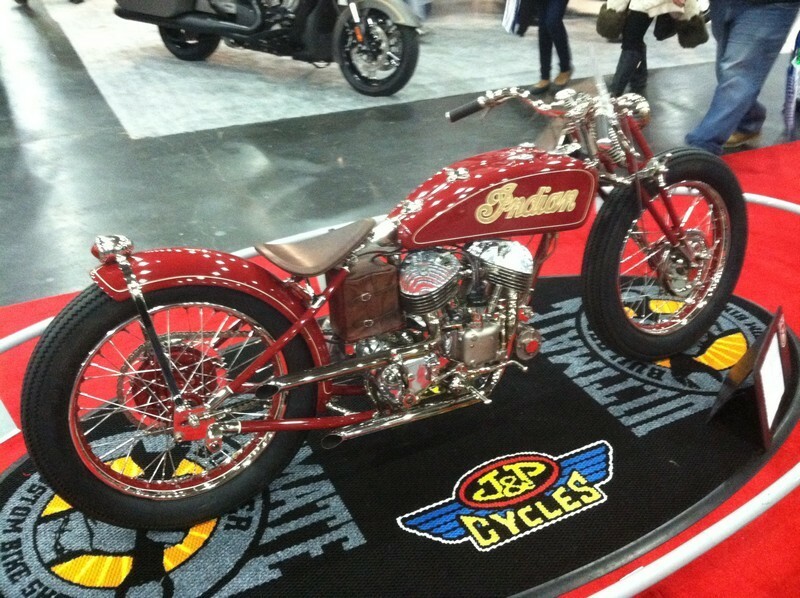 There are almost always displays with vintage props or other exhibits which feature classic bikes or classic themes and paraphernalia. So you can go to a show about the new and find a good bit of the old (see NYC 2010). 2013 was no different. Walking in you were greeted by some custom bikes with a variety of themes and by a variety of builders. The nice thing about New York is that the combination included rat bikes and café racers and streetfighters instead of just the usual array of unrideable superstretch choppers. Booths were there from most of the major manufacturers and a hoard of accessory merchants. The major motorcycle manufacturers seem to have settled on a pattern of defining niches and then copy each other. Adventure bikes seem to all have been patterned after the BMW GS, streetfighters seem to have all been patterned after the Triumph speed triple and Sport bikes seem to hold in patterned after the Ducati. This is a lamentable reduction in diversity, however there are a couple of manufacturers that seem to go their own way. Victory and KTM, are to be commended for sticking to their own unique direction despite all of the sameness around them. I hope the market rewards them. 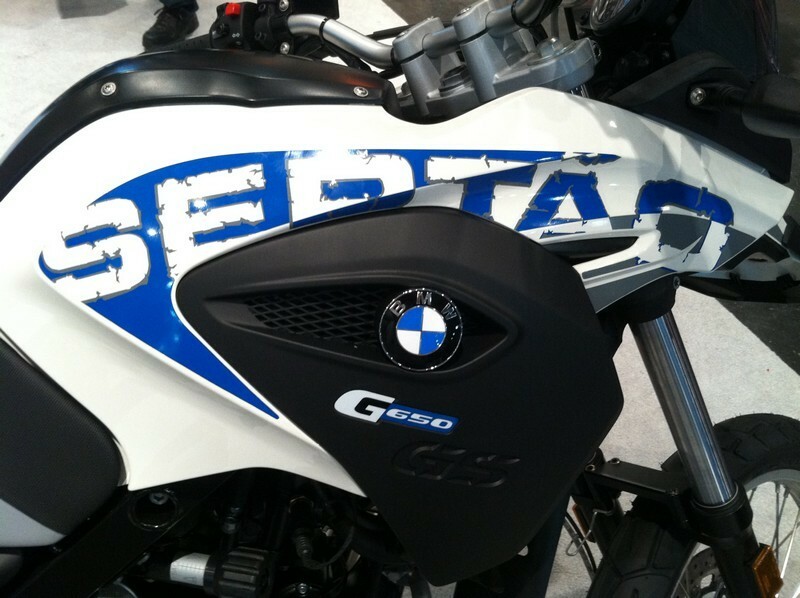 I did get a chance to take a good look up close at the new BMW R 1200GS in its' new watercooled form. This first watercooled version is very much akin to when the Porsche 911 finally went watercooled in the 90s. BMW has learned some very good lessons and has evolved the form only very lightly to minimize the dramatic impact of the new motor. There are many changes including a completely different clutch set up which will make it both lighter to pull and easier to service. The continued march of technology with respect to traction control, suspension control, and riding mode control on the fly, is evident in the new model as well. The sidepods that hold the dual radiators seem a bit vulnerable to me, but I'm sure that this bike has been through extremely rigorous testing. Time will tell. The windshield is also a dramatic departure in that it looks smaller and less effective, but I am assured by the BMW folks on hand that it actually does a better job of deflecting air than the prior generation. I am anxious to see what the adventure version of this new model will look like when it is released later this year. Hyosung was present with a major booth this year and would appear to be one of the major mainstream manufacturers if measured in square feet of carpet. There was less of a presence of the electric contingent this year with no Ebikes or Escooters. However there was a very interesting Chrisinti bike there with its two wheel drive system. There was an interesting display of Moto GP bikes, and a display of Burt Munro's (World's Fastest Indian) Bonneville machine. All in all, I thought that the show was interesting, but less so than in perhaps prior years. I realized upon leaving that I had very few pictures of new bikes! That might be just an interesting commentary though on the state of modern motorcycles. They are mostly all good, and it takes a lot to get our attention.